Today's Tidbit is a newer purchase, with a nostalgic story. You've all seen this before in a previous post. 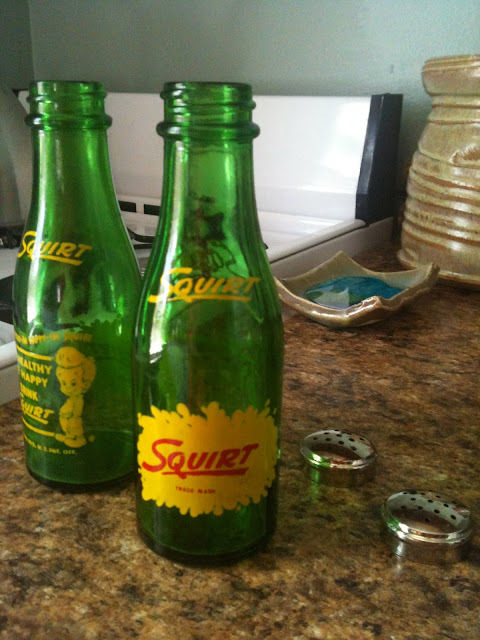 They are these awesome Squirt salt and pepper shakers that were my Grandparents. These now live in Portage - my Aunt inherited them and we both love them. I couldn't bear to see them leave Portage, but I curiously checked for them on E-bay. Interestingly, they are actually pretty affordable and plentiful. 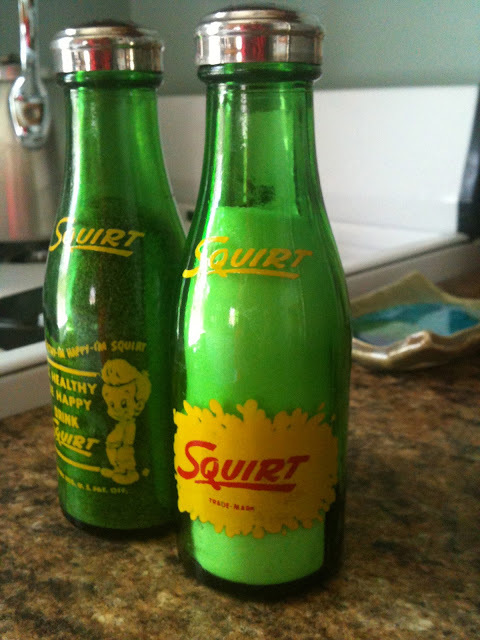 I guess Squirt put out a lot of these shakers for self-promotional pieces in the 50s-60s. There are newer plastic versions, but I was looking for the older ones that match the set in Portage. Remember seeing these back when I posted this winter? Now, I already have a pretty cool set of salt and pepper shakers. They are magnetic to each other which is a bonus (I love magnets). I like that they are a unique shape and size, and so simple in design. 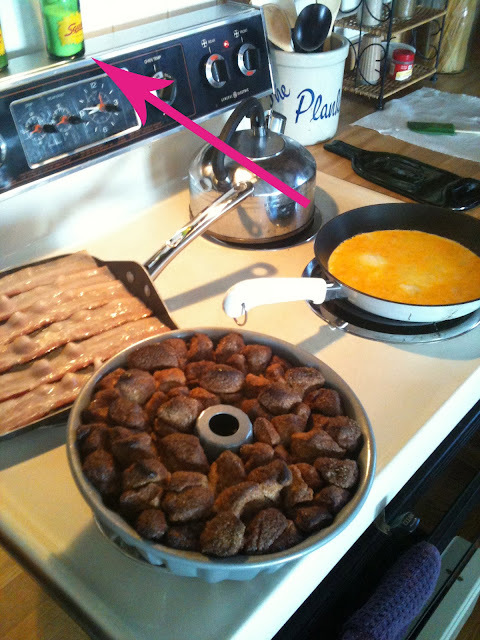 But, their major flaw is that the salt and pepper doesn't come out very easily. These match pretty nicely with my current decor and design. They are made by ElementalKitchen, and I love them as well. I don't want to start a salt and pepper collection; I'm not the collector kind of girl, but one day when I have a full kitchen with room for my table and possibly a breakfast bar... then, it will be nice to have more than one set! Here they are! I am so thrilled to have grabbed these for about $20, including shipping! The one thing I love but never realized that is great is that the holes are nice and big so the salt and pepper don't clump or get stuck. I know these probably don't 'match' as good as my other set, but I just love the memories of using these for dinners while visiting my grandparents growing up. I don't use Salt and pepper much growing up, but Grandma used to make Creamed Eggs (one of my favorites) and I would always douse it with loads of pepper. OH! I have a tip! Invest in these cheap plastic cutting boards. I think you can get a few for less than 5 bucks, PLUS I love that you can bend and flex them. 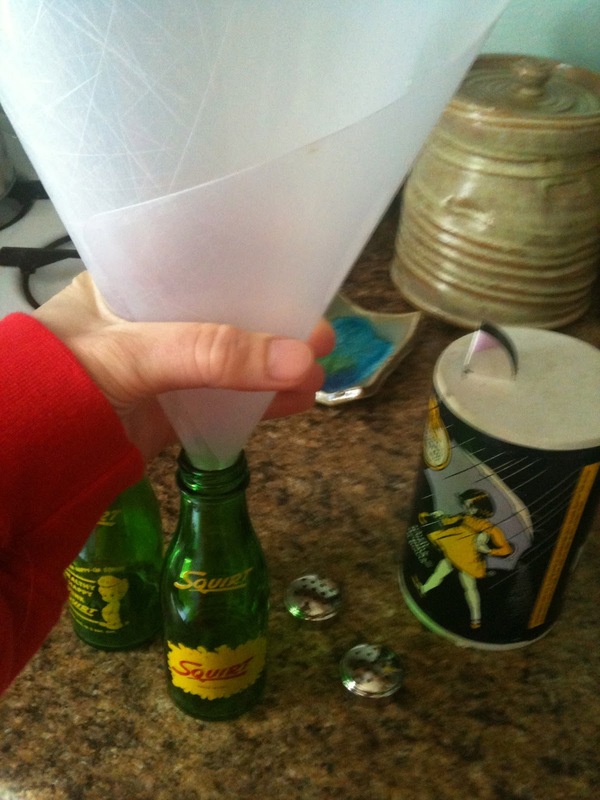 I use them as a funnel for jobs like this. Works Great! Functional and cool looking - Time to do more cooking!